We have developed a simple and sensitive colorimetric procedure for the quantification of trace amounts of uric acid. It is based on the finding that uric acid in a medium containing ammonia and sodium hydroxide at 65 °C can reduce silver ions to form yellow silver nanoparticles (Ag NPs). These are stabilized in solution by using poly(vinyl alcohol) as a capping agent. The yellow color of the solution that results from the localized surface plasmon resonance of Ag NPs can be observed by the bare eye. The absorbance at 415 nm is proportional to the concentration of uric acid which therefore can be determined quantitatively. The calibration curve is linear in the concentration range from 10 to 200 nM, with a limit of detection of 3.3 nM. The method was successfully applied to the determination of uric acid in human plasma and urine samples. 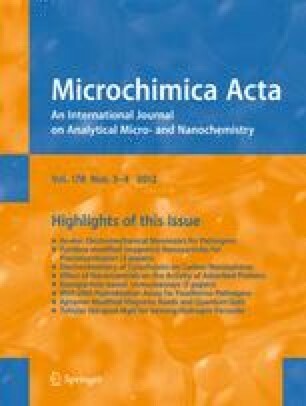 A colorimetric procedure has been developed for the determination of uric acid based on the formation of yellow Ag NPs by the reaction of uric acid with silver ions in a medium containing ammonia and sodium hydroxide at 65 °C. The online version of this article (doi: 10.1007/s00604-012-0849-7) contains supplementary material, which is available to authorized users.